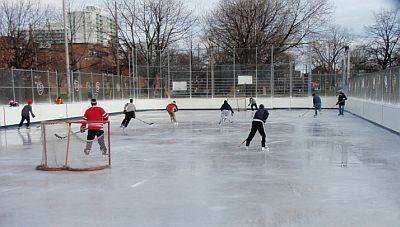 Compressors were turned on around noon, three Parks staff hosed down the rink at 6 pm. They said it was too warm to make ice but they had to follow orders. High 7, low 2. Sunny. Two hose-floods by Parks staff at 5 and 8; not much freezing. High 11, low 4. Cloudy. One hose-flood by Parks staff, they left at 8.15. Two hose-floods by volunteers, 10 pm and 12 midnight. Ice freezing. High 9, low 8. Rainshowers until late afternoon. Two hose-floods by Parks staff. The rain is good and the ice is getting thicker. Two hose-floods by volunteers, 9.30 pm, 11 pm. Ice building up well. One hose-flood by volunteer, 5 a.m. Five hose-floods by Parks staff, at 5, 6, 7, 8, 9pm. Two hose-floods by volunteers, 11pm and 1.30 am. Sun and cloud, high 11, low 6. One hose-flood by volunteer, 4 a.m. Opening day. Opened for 20 minutes, then directed to close. Great disappointment, to a man who came with his three sons and their two friends, all the way from Vaughn. 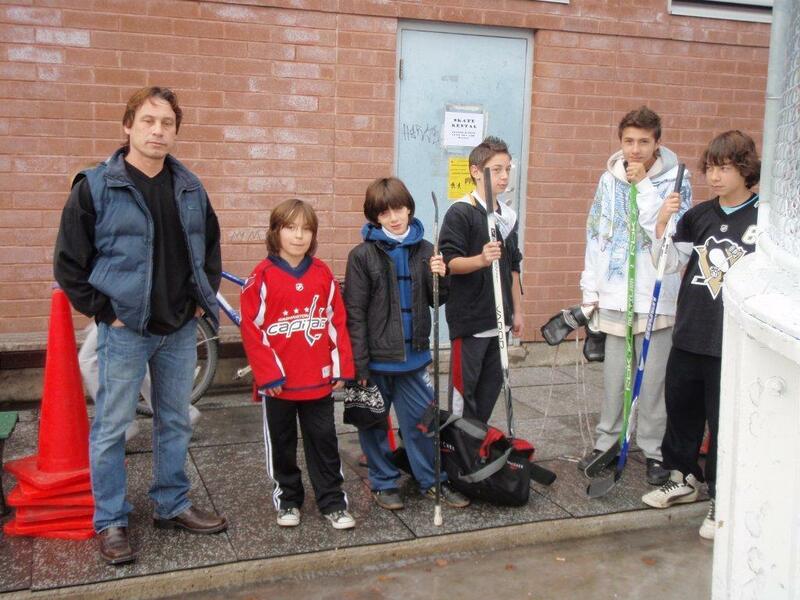 He said he grew up in the area, and he really wanted to show his kids what his old rink was like. The ice was thin in places but no worse than many days in the winter. But the kids were not allowed to skate at all. Everyone was unhappy. Ice maintenance staff put on 6 hose-floods before 10, then volunteers hose-flooded at 11 pm and at 1 am. Bright sun all day, high 11 celsius. Volunteer hose-flooded at 6 am. Ice was fine all morning despite the sun -- lots of people skating in short sleeves. Ice was covered with water by early afternoon but hard underneath -- never stopped being skateable. A man came to the rink and gave the rec staff three $100 bills as a rink donation. 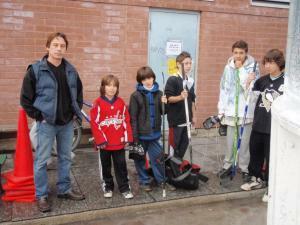 He said he'd read the Star article about the rink, and it had reminded him of the the good times he had there as a kid. What a nice guy! The first $150 will go to buy a printer for the rink, so the staff can keep up with their supply of skating schedules. Large numbers of youth out for pleasure-skating in the evening; then drop-in shinny and then a permit, plus more shinny on the pleasure-skating side after 9. Ice maintenance staff fit in several cold hose-floods -- ice froze into bumps. Volunteers hose-flooded at 11 and 1 a.m.
High 9, mostly cloudy with sunny periods in the morning. Ice was covered with rime at 8 a.m., but not too bumpy. Thin on the sun-sides. No sign of ice maintenance but later we heard that there was a zamboni flood at 5 a.m.
People came to skate over the course of the day, most because they had heard by the grapevine that skating was on. The ice became covered with a thin layer of water by about 2 pm, was dried up by about 6 pm. Many shinny players came out in the evening. One said that he had driven by and seen the ice, and called his friend to tell him. 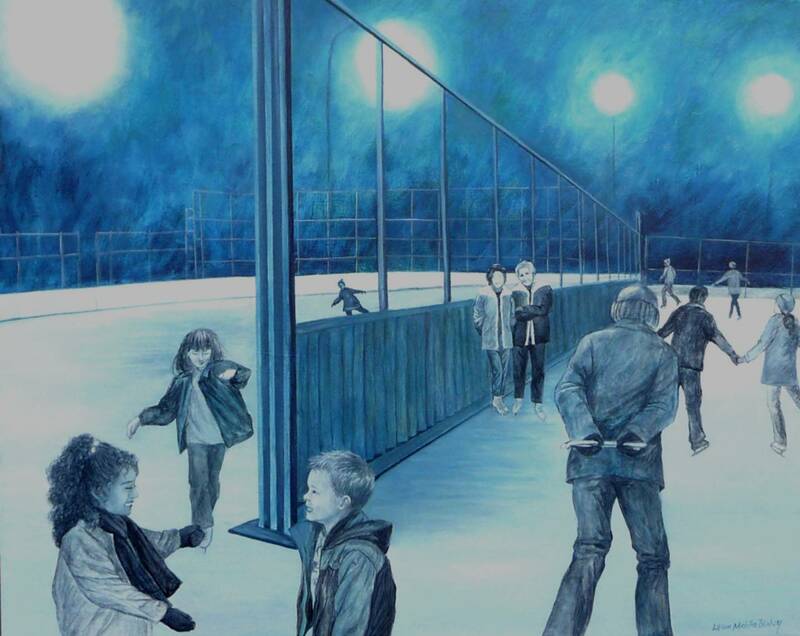 The friend didn't believe it, and told him to go stand right beside the rink with his cellphone, so that he could hear whether there really were pucks slapping the boards. So he did, and there were. When the permit group came at 9, Tim Freeman walked the ice with us. It was rough because there had still been no use of the zamboni, but Tim said it was much better than he expected. One of his team-mates took a look and turned to go home, saying he wouldn't play on that ice. Tim persuaded him to go out and walk on the ice. He discovered that there was no mush. The awful March mush doesn't come in November! So he went back in to the rink house and put his skates on. In the five minutes during which Tim was walking the ice, some kid stole his stick. Here we go. The ice maintenance crew agreed with their supervisor to stay late, until 2 a.m., to add more thickness. That was a surprise. Off and on drizzle a lot of the day, high of 8, low 6. The rink had a steady attendance despite the drizzle, with lots of youth in the evening. The first women's shinny of the year had only three women, so Deirdre Norman let it be known that they'd accept ten guys from the other hockey game (on the pleasure-skating side. Ten eager players came over on the run. But shortly they forgot that they were guests, and the women didn't spend much time with the puck. That was good proof -- again -- of why it's not a good idea to let the guys on at the same time. The ice maintenance shift was from 5 pm to 2 am, and they took the zamboni out at 5, 7, and 9 (and then again after the rink closed). The ice was perfect. High 9, low 6. Rain showers off and on for much of the day, ending in the late afternoon. Again the ice stayed hard and smooth under the water, and the water froze up fast when the rain stopped. Lots of shinny players on the hockey side all evening. The women's permit didn't show, so the rink rats got an extra hour of fantastically fast shinny. A group of newcomer kids showed up from an organization called "Culturelink." They had called ahead to say they would need to borrow 15 pairs of skates. When they came, there were 61 kids, and they all needed to borrow skates! But the staff managed to outfit them. 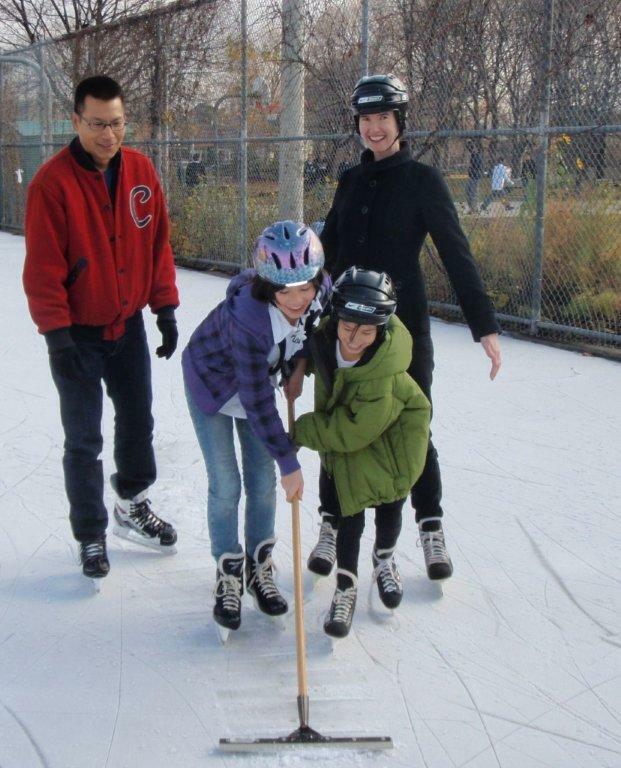 Many had never skated before, and they were plenty wobbly out on the ice, but they learned fast, with enthusiasm. 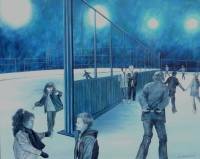 A woman named Lillian Michiko Blakey wrote in with a very nice story of skating at Dufferin Rink 50 years ago. We put it up on the rink house bulletin board. The ice maintenance staff said they are on until 2 a.m. for the last time, so they said this time they'll try to really concentrate on flooding the edges and the corners. High of 8 -- stayed there a long time, then down to 4 in the evening, low of 0 overnight. The ice maintenance staff came at 3 but said they had been told to stay until 2 am again, to keep building up the ice. There's lots of ice but the driver has been directed not to scrape, only to flood, to build more ice, so it's quite bumpy, with all those skaters out there. The part under the gate is nasty, because there's so much dirt under the ice that it's almost muddy. Too late to clean the dirty concrete now -- and this is all part of the strange setup with the City. In point of fact, there was a thin layer of water on the ice because the sun came out for a while in the afternoon. It was fine for skating, but there was nothing for these two ice maintenance staff to do until their first flood at 7. Three hours of overtime at the other end, with no reason to be there for the first three hours -- remarkable. A kid got hit in the mouth with a stick and bled copiously. His lower lip and chin were quite swollen. The program staff gave him lots of gauze and told him to sit and put pressure on his chin. As soon as the bleeding stopped -- lips repair fast -- and while the program staff were still wiping the blood spots off the rubber mats, he was back out on the rink, skating. The kids are all three-quarters of a year older than when we last saw them. One of the long-time rink rats from a troubled apartment building near here says he's at George Brown College now, studying electromechanical engineering, or something like that. Another long-time shinny player said he couldn't play tonight because he turned his ankle at work -- he's a car mechanics apprentice now. A few of the rink rats who almost live at the park in the winter have gone to jail. But most of them have gone into solid, practical jobs, not in the virtual world of computers. Good ice but too many people, despite the fact that none of the City information sources report Dufferin as open. The word got around anyway and in the evening there were too many people wanting to play hockey, they could hardly get on. Sad. However, one cheerful shinny player said -- "not having enough is even worse." Good ice again, but again it got too full toward late afternoon. A troublemaker kid from last year came and made even more trouble. The staff called Corporate Security, but the security guy who came was spooked -- he didn't want to make the kid leave, saying that the kid probably had his friends waiting. Good grief. These security guys get paid high wages, for acting like the OPP in Caledonia. Despite these struggles, there are so many kids around who look so pleased that they can skate and play shinny. Very nice. The day ended rainy, but it began with a weak sun, and with people waiting at the door at 9 a.m. All day there was a crowd, but still people were cheerful. So many people rent skates, and half of them are newcomers. Plus there are all the parents whose kids are growing so fast, and they can bring everyone skating because they don't have to worry about buying new skates yet. A Chinese women who can hardly speak English brings her little girl, aged 8. The little girl is a figure skater, and her mom seems to be supervising her "homework." Considering how bumpy and crowded the ice is, it's hard to see how anyone could practice there, but the little girl does practice, and she looks happy doing it. All around them are the kids learning with a chair, and the kids playing chase, and the kids yanking each other's hats off and whacking each other. The staff get exasperated, and they have to remind each other that the first two weeks of the season always seem impossible. 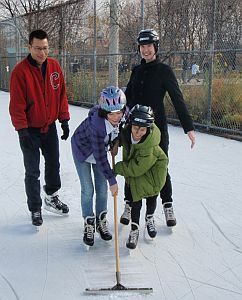 But then the other rinks open, and the kids calm down a bit, and the individual stories -- so many of them! -- begin to form, out of what was formerly a lot like chaos. The rink is so full, people can't play very well. Only five of the 14 rinks scheduled to open, actually did open, two with fully permitted hockey pads. People are coming from across the city to skate here. They're excited when they get here, but many leave after a short while because it's so crowded. That's a bit distressing. Hopefully the other rinks will open on time (i.e. this coming Saturday) and there will be room for all. The security staff contacted the Saturday troublemaker's mom so she could talk to the staff directly. That's smarter than we thought at the beginning. Maybe they have some ideas about follow-up, and we shouldn't give up on them yet. how many can play at once?